The following story appeared on WorldNet Daily’s (WND)website the other day, detailing the lawsuit Oklahoma’s own Kaye Beach is engaged in regarding the use of biometrics on the Oklahoma driver’s license. The battle Kaye is involved is really for all of us concerned with the continued collection of personally identifiable biometric information by the state – one that leaves no options for Bible-believing Christians. An Oklahoma requirement that driver’s license applicants submit to “biometric” digital photographs – which are “stored and shared” without the applicant’s knowledge – is a violation of religious rights, charges a lawsuit filed against the state’s Department of Public Safety and several individuals. The suit names Public Safety Commissioner Michael C. Thompson. The state has told the plaintiff, Kaye Beach, that she must submit to the biometric requirement to obtain a license in the state, and there is no exemption based on religious beliefs. The lawsuit contends the requirement, however, violates the Oklahoma Constitution because it “substantially” burdens Beach’s free exercise of religion and does not accommodate her sincerely held religious beliefs. “Whether a biometric ID card in the form of a driver’s license or other government-issued form of identification is the mark of the Beast or merely the long arm of Big Brother, the outcome remains the same – ultimate control by the government,” said John W. Whitehead, president of The Rutherford Institute, which is handling the case. “As Kaye Beach’s case makes clear, failing to have a biometric card can render you a non-person for all intents and purposes, with your ability to work, travel, buy, sell, access health care, and so on jeopardized,” he said. In March, Beach applied to renew her driver’s license with the Department of Public Safety, the organization reported. Upon learning that the biometric photographs used by DPS are stored in a database that is managed and accessed by international organizations, Beach repeatedly voiced her religious objection to the practice and asked to be allowed to use a low-resolution photograph for her license. Beach subscribes to the Christian belief, detailed in the Bible’s book of Revelation, that Christians must not participate in a global numbering identification system. Rev. 13:16-18 and 14:9-11 “explicitly commands believers to not participate in a global numbering identification system using the number of man, and eternally condemns participation in that system,” the lawsuit contends. Officials with the state agency declined to respond to a WND request for comment. The institute’s report said Beach met all of the other requirements for a license and was deprived of that opportunity – “including the ability to acquire prescription medications, use her debit card, rent a hotel room or obtain a post office box” – only because of the state’s refusal to provide a religious accommodation. The case was brought in district court of Cleveland County. Rutherford Institute attorneys point out that the state’s requirement for a biometric photograph does not serve a compelling state interest and that the state has other means for furthering any such state interest. OK-SAFE, Inc. – The first meeting of the Oklahoma joint legislative committee formed in spring 2011 to examine the impact of the federal healthcare reform law/exchanges on the state of Oklahoma was held in the House Chambers on Wednesday, Sept. 14, 2011 at the OK Capitol. Some key transcriptions of the comments by two presenters – Julie Cox-Kain of the OK Dept. of Health on the exchanges, and Buffy Heater of the OK Health Care Authority on the information technology system changes required. Consider their presentations as confirmations of what OK-SAFE and others have been researching regarding the intent and purpose of healthcare reform and the role the exchanges play: the creation of a ‘fused’ technology system that contains comprehensive information about all individuals, connected to/interfacing with a developing federal data hub, or federal data ‘cloud’ as it was referred to. It is confirmation of the Vision 2015 document issued by the Director of National Intelligence – a roadmap for the systemic change of our entire governmental structure. Buffy Heater (OHCA) presentation – “Now we’re going to talk about the technical aspects of information systems changes. So I think I’ll start off by addressing the question that was brought up earlier in the session about the federal data hub or the federal data exchanges that are being established as part of the ACA through both the exchange set-up as well as for the Medicaid income verification pieces. So basically, the federal government is creating a data hub, or a data cloud, as it be, in that there will be sources from federal agencies, the IRS, the Social Security Administration, and the Department of Homeland Security, where there will be member level or individual level information that is fed up to this data cloud. Then there will be queries from the states or from a federal exchange that will be able to be sent up to that federal data hub and a match return, that basically says for this person’s last IRS data here was their modified adjusted gross income. Or validating that that individual’s social security number is as was reported matches, yes indeed, it matches on that individual’s name and date of birth. As well as the Homeland Security is going to verify individual citizenship and identity, if possible. (Slide) New CMS IT Guidance – Service Oriented Architecture, Reusable, Interoperable, Scalable, Ease of Use. Some states are still using legacy mainframe systems. So federal government required (above list). (Slide) CMS IT Funding – Enhanced funding available – Medicaid Eligibility Systems (thru 12-15-2015) – 90% match – design, development and implementation. 75% match – ongoing operations. In the past was only 50%. Chart of Determinants of health and their contribution to premature death. Environmental, social circumstances (stressful), healthcare 10%. Insurance reform addresses access to health care, genetic disposition, behaviors. United Health Foundation rankings for Oklahoma 2010 – showed selected health measures: cardio vascular disease, tobacco use (25%) 48th in nation, access to care measures, leads to other outcomes we’d like to track in our state. (Prevalence of obesity in our state), preventable hospitalizations, i.e. people aren’t controlling their conditions very well; infant mortality rate (significantly higher than other states); immunization coverage, lack of health insurance; primary care physicians availability. Overall health ranking is 46. United Health Foundation Rankings Oklahoma 2010. We track fruits and vegetables consumption. Only 14% of our population gets 5 fruits and vegetables/day. Other stats on people’s behaviors. How are you feeling? 19% of our population responded that they don’t feel very well. Leading causes of death in Oklahoma. Total Mortality Rate per 100,000 Population – 2005-2007. Source: State of our State Health Report. Some counties earned an “F” due to chronic conditions and behaviors. Leading risk factors for Heart Disease: Physical inactivity, overweight and obesity, high blood pressure, smoking, high cholesterol, diabetes. Leading Cancer Types in Oklahoma – Lung disease, etc. Chronic Obstructive Pulmonary Disease in US 1999-2006. Oklahoma has high rate of burden. Infant Mortality Rate per 1,000 Population 2005-? Risk factors for Infant Mortality – lack of prenatal care, poor nutrition, etc. Adult Obesity – OK at 32%, trending up. Expensive to treat, this is an economic issue. Tobacco Use – slight reductions in use, still over 25% of our population still smokes. Summary of Health Status in Oklahoma. Q. Mulready re $5 billion attributed to obesity, could you name the top three things we could do to impact that, those are public dollars. A. One thing we can do is create the expectation that we expect wellness, physical activity in school, we need to support communities and empower them to make good choices, increase access to fruits and vegetables. These are available in Certified Health Communities program. Certified Healthy Business program, too. Q. Rep. Grau re ratio of primary care physicians ranking near the bottom, physician assistance, nurse practitioners, telemedicine? A. Run the state office of primary care. Q. Grau re pancreatic cancer – outside factors that contribute? A. High teen pregnancy rate so parents don’t have time to educate their offspring on the issue. The rest of notes on this meeting are on the OK-SAFE, Inc. website here. Update to the OK-SAFE Action Alert that went out this morning – it now appears that the first meeting of the joint committee to examine the effects of healthcare reform/exchanges, scheduled for Wednesday, Sept. 14, 2011 will be aired live and viewable online via the Oklahoma House of Representatives website. The meeting begins at 9 am and runs until 4 pm. See prior OK-SAFE post for the agenda. To view online go to http://www.oklegislature.gov/, click House Video – Live on the House Floor. This information is being provided for those not able to attend this important meeting in person. If you would like to contact your OK legislators about this subject, go to the OK Legislature home page, then click on Legislators to find their contact information. The first meeting of the joint legislative committee on the effects of the federal health care law (Affordable Care Act, aka “ObamaCare”) on Oklahoma will be held in Oklahoma City on Wednesday, September 14, 2011 at 9:00 am in the House chamber at the OK State Capitol. This first meeting appears to be featuring some of the key members of the Health Insurance Exchange Steering Committee from the Oklahoma Health Care Authority. The OHCA is the recipient of the federal grants to implement health care reform, including a $1 M planning grant, as well as being the intended recipient of the $54 M Early Innovator Grant the state accepted then “rejected” earlier this year. Committee co-chairs are Sen. Gary Stanislawski and Rep. Glen Mulready. Every Oklahoman with concerns about the implementation of health insurance exchanges (now “marketplaces”), the use of electronic medical/health records and medical privacy should try to attend this meeting. This looks to be an all-day meeting, so come prepared to spend some time. The entire notice is below, including the joint committee members. Future meetings are to be held in Tulsa, and then again in Oklahoma City. Dates and times are not confirmed at this time. The article below, dated Sept. 2, 2011, is from the China Daily USA news site about Indiana Governor Mitch Daniels’ latest deal with the Chinese. Daniels recently attended the National Governors Association (NGA) meeting in Salt Lake City, Utah July 13-17, 2011 which included the first-ever U.S.-China Governors Forum. The purpose of the Governors Forum was to increase cooperation between the U.S. and China at the sub-national level. Looks like Mitch took the meeting to heart. Their landmasses are very similar. Manufacturing dominates each region. Each is economically invested in what the other region produces. The connections between the state of Indiana and Zhejiang province, which established ties as sister states in 1987, are already numerous, but in the next few years, leaders from both regions say they are planning to further cement economic ties. “Indiana is very excited and proud of the significant flow of the Chinese investments that have only begun in our state. 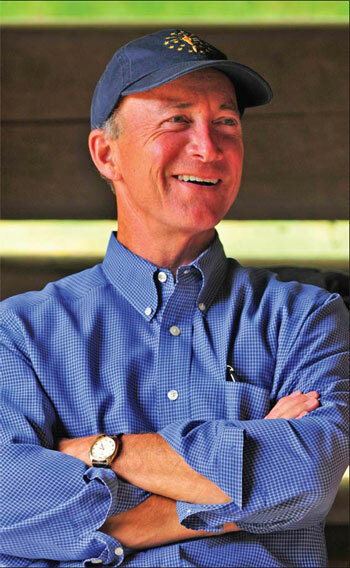 We hope Chinese investments will continue to rise sharply in our state,” says Indiana Governor Mitch Daniels. China is Indiana’s fastest-growing export market. According to a report from the US-China Business Council, the state’s exports to China in the last 10 years have grown a hefty 554 percent, while the state’s exports to all other countries have grown by 81 percent. Daniels says China has contributed at least five significant job-creating investments to the state in the last few years in sectors ranging from manufacturing to automotive to agriculture and furniture. China’s investments across many sectors of Indiana reflect the nation’s growing investments across the United States. A recent study by the Asia Society in New York estimates that China could potentially invest almost $2 trillion overseas in the next 10 years with a great portion of that heading to the US. When Daniels first took office in 2005, he made job creation his top priority. He created the public-private Indiana Economic Development Corporation (IEDC) to replace a failing state bureaucracy in attracting new jobs. In 2008, CNBC named Indiana as the most improved state for business in the nation. As a result of his efforts, Indiana’s cemented relationship with Zhejiang province has brought Chinese businesses to the Hoosier state, such as Wanxiang Group Corp and Anji Yuankai Furniture Co.
Zhejiang, located on the east coast of China, is known for its thriving private sector. Daniels says he wants to concentrate on attracting the province’s investments. He has visited Zhejiang twice in the last two years with other Indiana officials and business executives.” Rest of China Daily article here.